Two Texan girls in the kitchen means the best kind of trouble is coming your way! When I met Marta Sanders, I was immediately drawn to her. She knocked me out with an amazing performance in a very impressive venue for the Cabaret Convention earlier in the year. 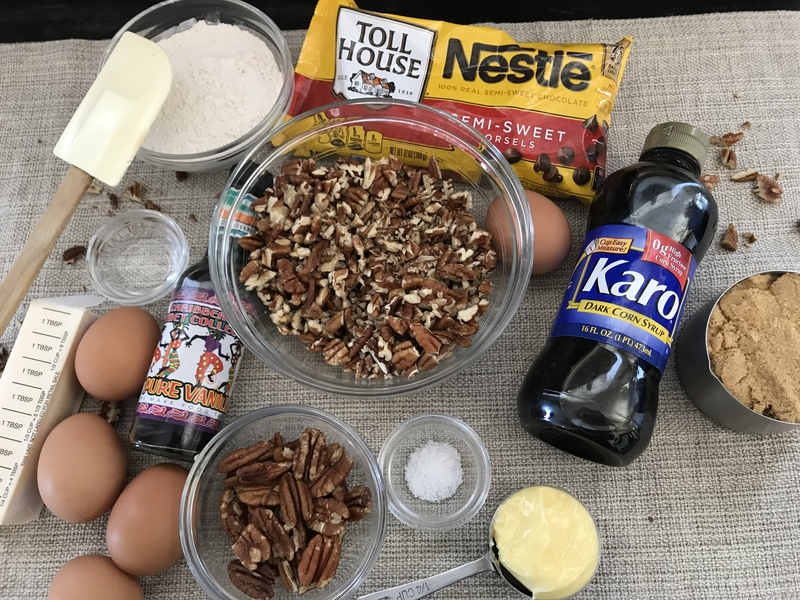 When I found out she made a chocolate pecan pie to die for, I knew that she had to teach me how. 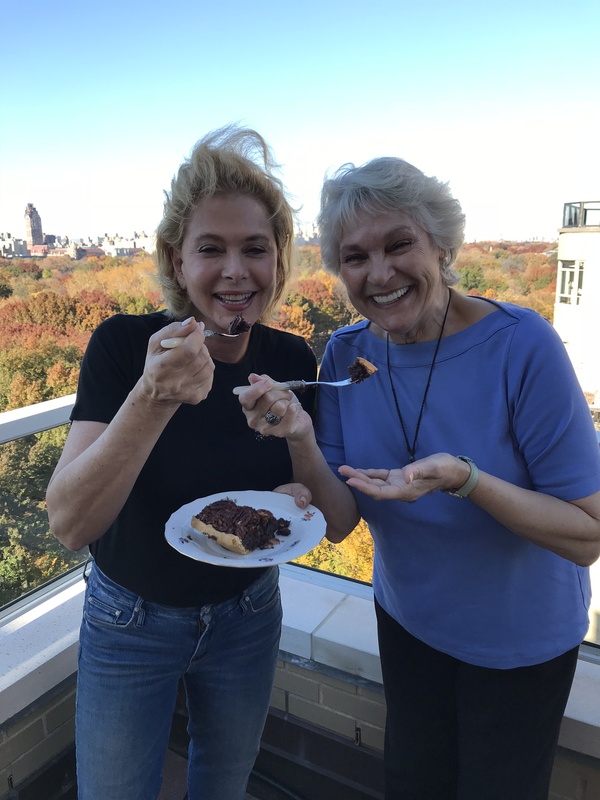 We had so much fun reminiscing over our childhoods and pie-loving experiences that I was amazed we were still able to pull of such an addictive dessert. So often I get to cook with top restaurant chefs who know all the tricks and have the best tools in the trade for everything they do. 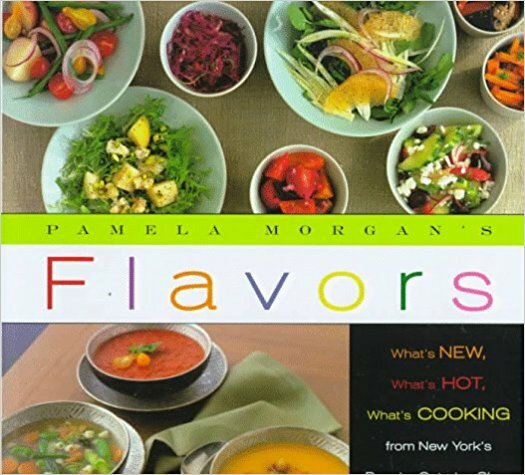 But, as with most home cooks, Marta’s methods are not as much about precision or the perfect ingredients as they are about getting the job done and sharing a dish that comes from the heart. 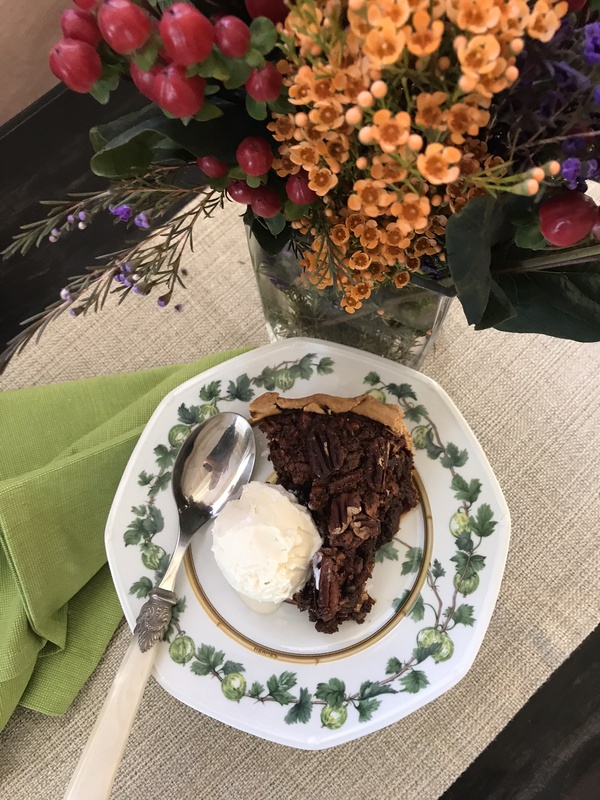 She’s been doing the same pie recipe for years, as baking was something that was almost meditative for her, especially as she was raising two girls in New York City. And now she’s sharing her secrets with us all! One little trick that is a new part of her recipe is this pie shell protector from Talisman Designs that helps to keep the beautiful crust from burning. 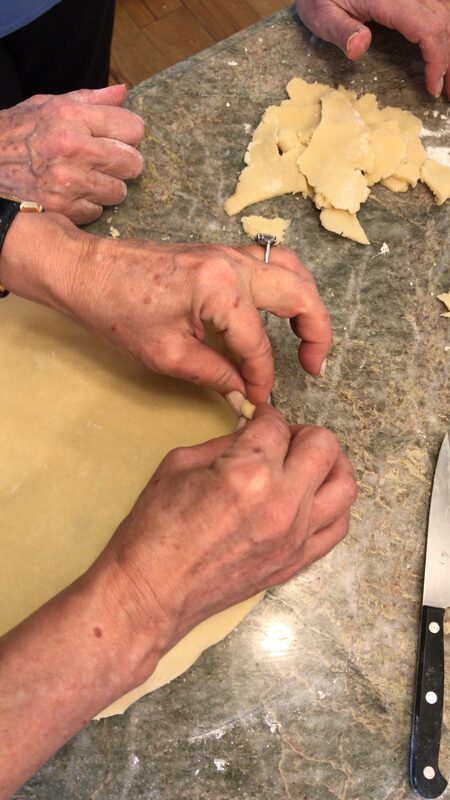 We’ve also included her tips for what to do with the extra pie crust–but if you could do a variety of things with them. 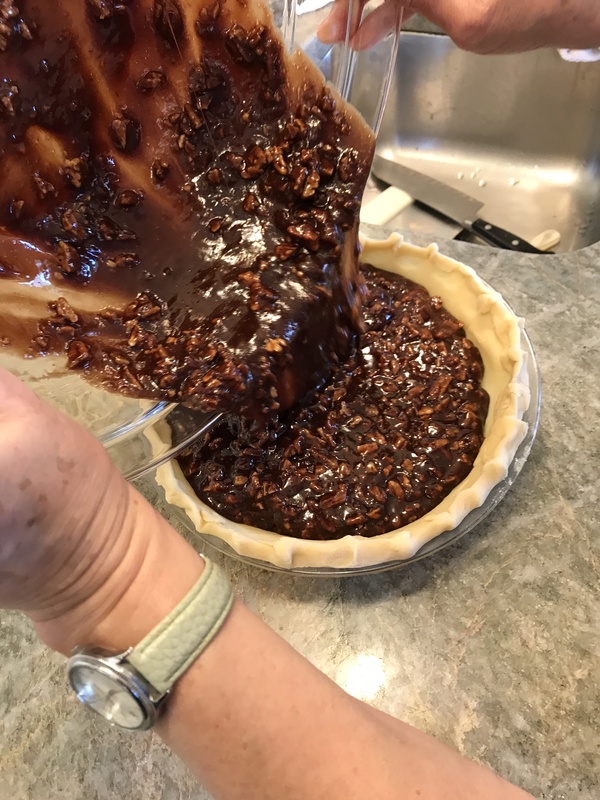 You can make the crust well in advance if you would like, and then just make sure it’s warm enough to work when you’re ready to make the filling. Add the flour, salt, and butter in a food processor and pulse until you have an oatmeal-like consistency. Remove the blade from the processor. In another bowl beat egg, vinegar, and water until fluffy and pour into flour and mix to combine. Roll out about 8 inches of wax paper onto a clean, hard surface. Place the dough onto the paper. Knead the dough into a ball, but be careful not to overwork it. Wrap the ball in wax paper and chill in your refrigerator overnight. You may also freeze the dough for at least an hour, or up to a week. 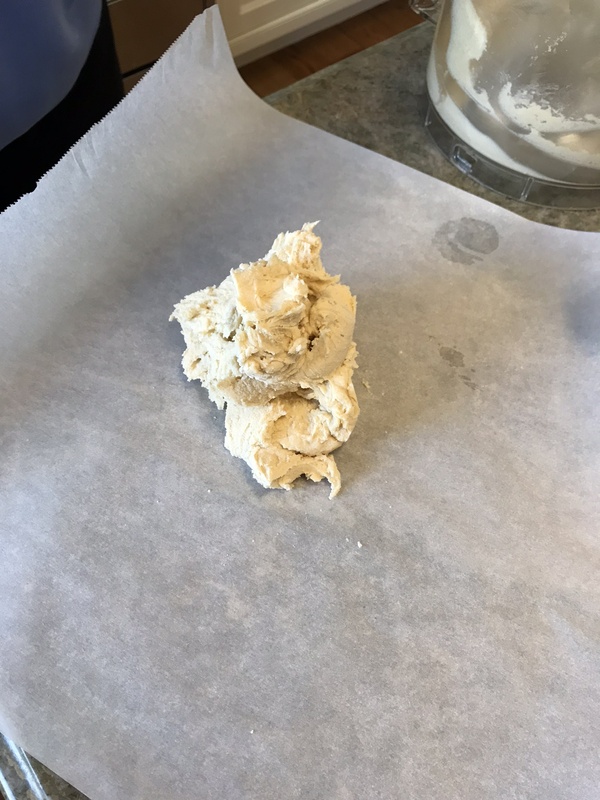 Be sure to let the dough stand at room temperature for 20 minutes or so, if frozen, so that you can work with it when you're ready to make your shell. 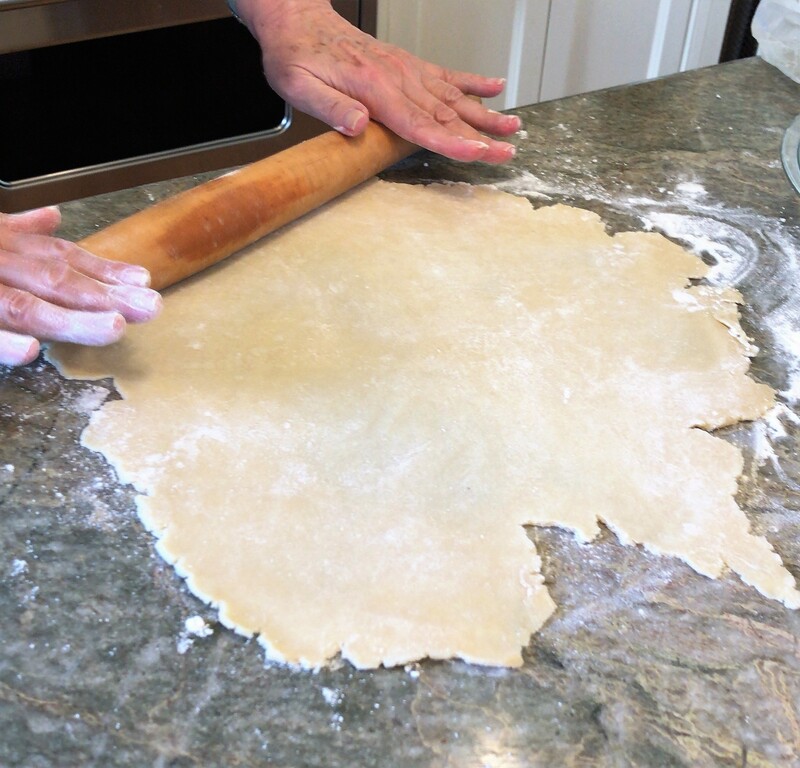 When your dough is ready, flour your clean flat surface, and roll it out with a rolling pin. You want about 1/4 inch thickness, and you want to be sure it's large enough to fill your 9-inch pie pan. 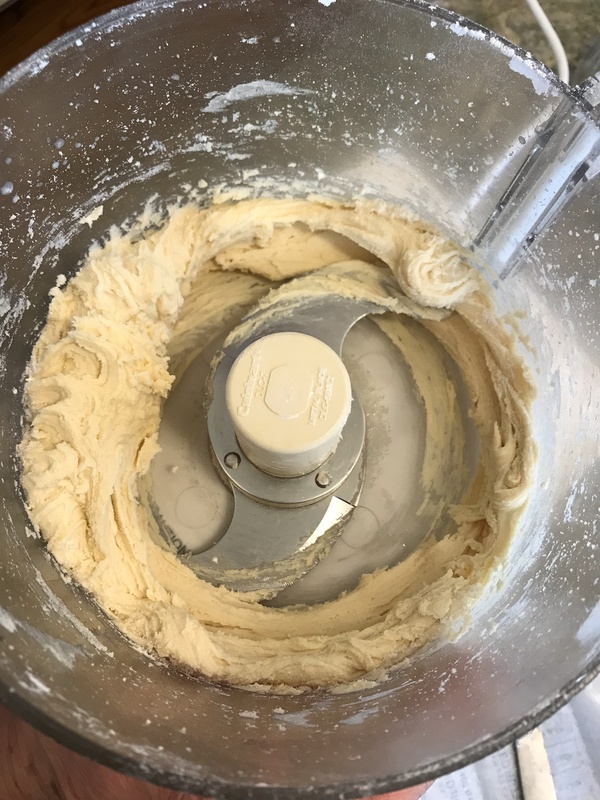 When your dough is ready, get your pan in place next to you, roll the dough onto your pin and raise it over your pan so that you can roll the flat dough over and into the pan without tearing it. Take a knife to cut the excess dough off from around the pan. You want about an inch or so of extra dough to be able to crimp into the perfect crust. Save the leftover scraps. With your fingers, go around the pan gathering the extra dough to fold and pinch into little peaks. If you have a hot kitchen, you can put your pie shell into the refrigerator while you make the filling. Take the leftover crust scraps and place them on a baking sheet and sprinkle a little sugar over them, then place in the oven for 10-15 minutes until they're just crisp and enjoy with your kitchen helpers as you finish making the filling. 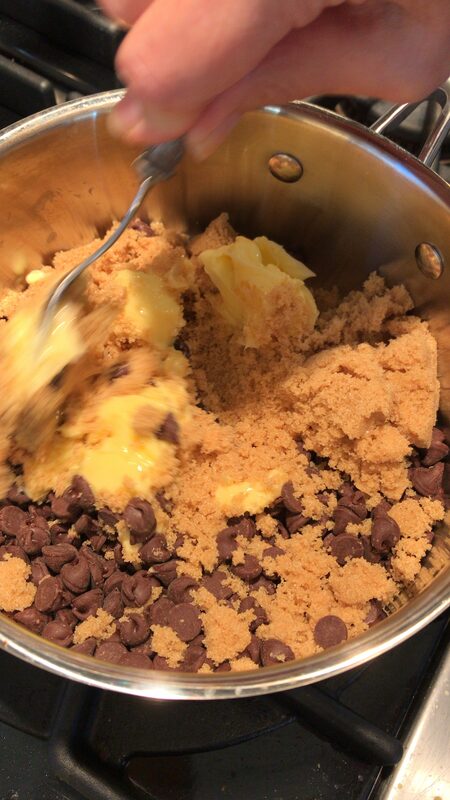 In a saucepan over medium low heat, melt sugar, butter, and chocolate, about 5 minutes. Turn off heat, and let cool slightly. 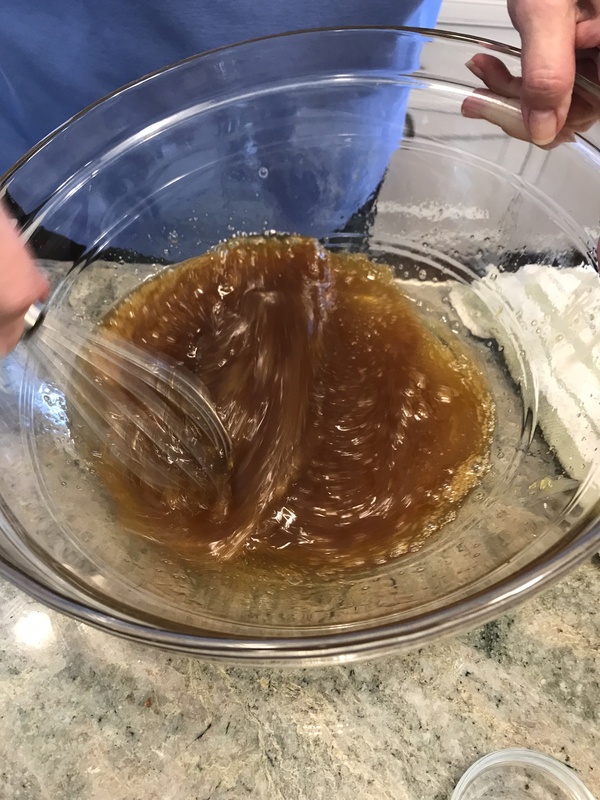 In a large bowl whisk together eggs, corn syrup, vanilla, and salt. 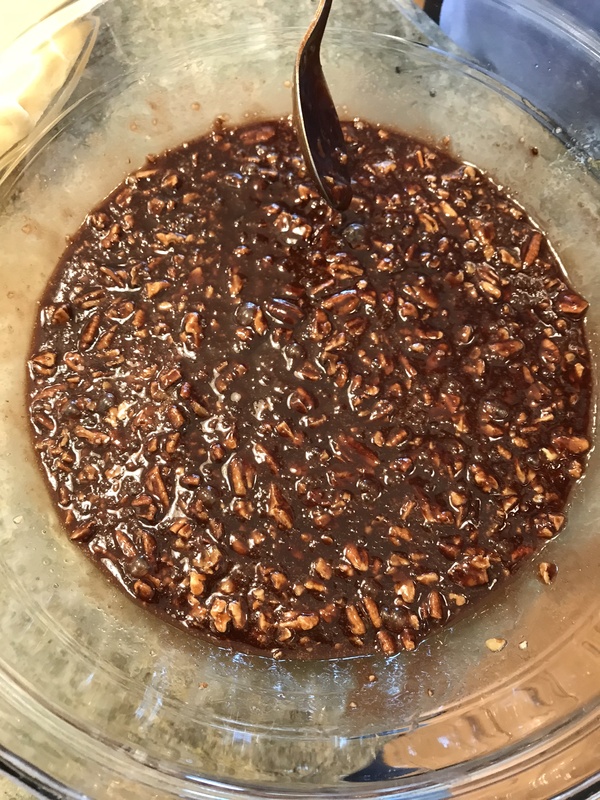 Stir in melted chocolate mixture and chopped pecans. Pour mixture into uncooked pastry shell. 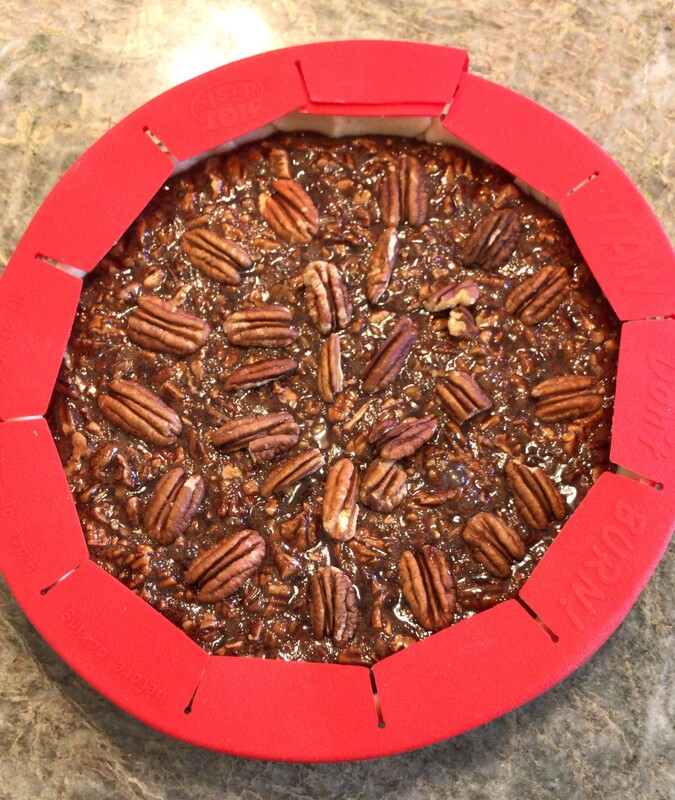 Decorate with whole pecans. If you purchased the shell protector listed above, you can cover your crust with it and then put your pie into the oven. You may also try using some aluminum foil. This prevents the edges from burning. Bake for 45 minutes and remove the protector or foil and then put back into the oven for another 10-15 minutes. Test your pie with a toothpick to see if it's cooked in the center--it should enter and exit the pie dry. Your pie filling may rise while it's hot--don't be alarmed as it will return to a normal shape once it's cooled. Once it's cooked through, remove from the oven and cool on a rack for at least 10 minutes. Serve warm with some vanilla ice cream or whipped cream if you'd like.